Back Is the North Atlantic partnership in danger? Geographically, Europe is a peninsula on the northwestern end of the Afro-Eurasian continent, on the eastern shore of the North Atlantic. 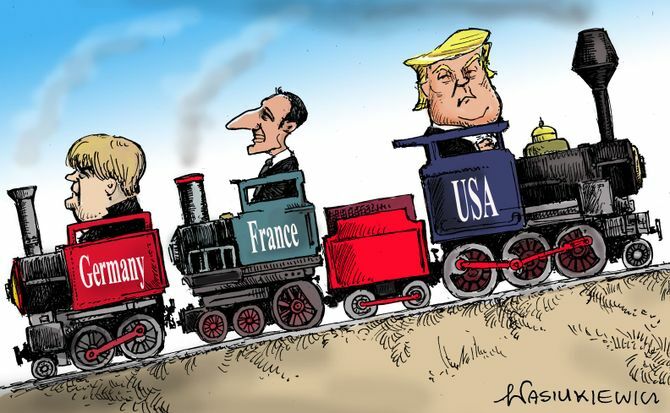 The United States, on the other side of the easily navigable ocean, can be considered – as former U.S. President Ronald Reagan once pointed out during a speech in Germany – a European power. Indeed, the U.S. has provided a protective shield over Europe since the end of World War II. While the Soviet threat remained in place, Europe, and especially Germany, was highly appreciative of the U.S. However, the relationship began to deteriorate in the late 1960s, enhanced by Soviet disinformation and supported by protest movements of the so-called “1968 Generation” and the Vietnam War. Since then, Europe’s relations with the U.S. have become increasingly schizophrenic: Europe still needs American protection, but is trying to build increasingly important relationships with Russia and China. This, however – due to lack of military power – is insufficient to balance Europe’s position as a North Atlantic and Eurasian region. To keep good relationships, Europe needs both sides. However, in instances of tensions between the Atlantic partners, the European public and politicians have – especially over the past 20 years – taken a very one-sided course, looking for faults only on the American side. This has been especially striking in the relationship with U.S. presidents. In Europe, President George W. Bush was considered a danger, while President Barack Obama was well-liked. Now, Donald Trump is considered a major threat to world peace. However, if one ignores some of his rude behavior, one can find sound policies and people in his administration who consider Europe’s protection a top priority. There is a European schizophrenia in the admiration of President Obama’s policies and the claim that Presidents Bush and Trump hurt the transatlantic relationship. Both the Bush and Trump administrations considered Europe an important issue, while Mr. Obama’s pivot to Asia had a distinctively different orientation. Europe was clearly a less significant concern. President Trump’s decision to withdraw the U.S. from the Iran nuclear agreement has again caused strain in the relationship. Some claim the move is a major threat to the international framework and stability. According to the European mantra, there is one culprit: Donald Trump. On the surface this might appear correct, but if we dive a little deeper, the story looks somewhat different. Iran’s politics, as well as its military and paramilitary activities, including the support of terrorism, is destabilizing the entire Middle East. Tehran intends to become the dominant regional power and advances that agenda with all means, it supports civil wars and threatens Israel’s very existence. Moreover, it poses an existential danger to Saudi Arabia, doing its utmost to control Syria and Yemen. Its support of terrorist organization Hezbollah weakens Lebanon, strengthens its own access to the Mediterranean and makes possible direct attacks on Israel. All of this also presents significant challenges for Turkey. The Iran nuclear agreement, which was reached between Iran, the five permanent members of the Security Council (the U.S., Russia, the United Kingdom, France and China) plus Germany, did not include any of the neighboring countries. It contained no provision that protected Iran’s Middle Eastern neighbors from its subversive and terrorist agitation. The agreement was a priority for President Obama, and the administration was in a rush to conclude it, but the Europeans could have pointed out this problem. The European leaders in the UK, Germany and France are now appalled that the new administration withdrew, considering the deal damaging and incomplete. French President Emmanuel Macron and German Chancellor Angela Merkel both visited Washington in April, begging President Trump to maintain the agreement. President Macron tried to use French “grandeur” and youthful charm, while Chancellor Merkel tried the German attitude of “Bedenken” (compunction). Both in vain. Does that mean that Washington made the wrong move, and the White House is at fault? Not necessarily. Since the 2016 U.S. presidential campaign it had been well-known that Mr. Trump considered the agreement deficient and that he wanted a replacement. Once he was elected, London, Paris and Berlin had ample time to try to renegotiate with the other partners of the agreement. This was neglected, and President Trump’s move cannot be a surprise. The consequences of the withdrawal are still unknown. But now the paradox is that the UK, France and Germany are seeking the support of Russia and China in counterbalancing the U.S. This situation was only triggered by Washington’s decision, but widely caused by European negligence. The losers in all of this are certainly the countries of the Middle East, but also, and especially, the Western alliance.